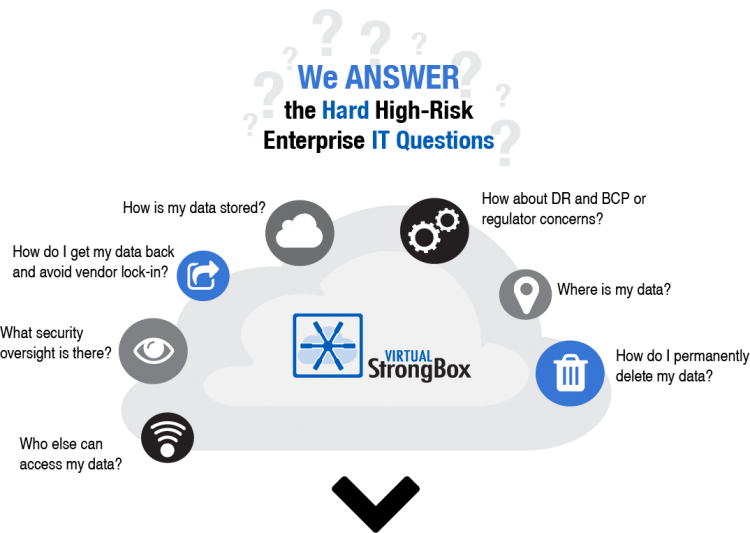 The Virtual StrongBox customer engagement platform enables and protects the collection, exchange and storage of information between the enterprise and the digital consumer. We even have patented security measures that ensures someone with direct access to the server holding the data would not be able to view the documents in a Virtual StrongBox. Along with a data shredder that tears apart a file once it’s deleted, TIPP ensures users’ Personally Identifiable Information is never vulnerable to security threats. Our patented security measures ensure Total Information Privacy & Protection. Q. How is my data stored? All data is encrypted in transit and encrypted at rest at the file level in our environment. Q. Where is my data? Your data is stored in our private data centers. In the United States, data is stored in Charlotte, NC and replicated off-site to Little Rock, AR. Q. What security oversight is there? WHAT SECURITY OVERSIGHT IS THERE? Virtual StrongBox uses SSAE 16 Type II accredited datacenters to host our SaaS application and metadata. We also engage with third parties to perform periodic risk assessments and gap analyses. Q. Who else can access my data? Only the Virtual StrongBox owner has the key to open the files placed in their personal StrongBox. Neither our employees or employees of the service provider have access or have visibility of any documents until granted permission. Q. How about DR and BCP or regulator concerns? How about Dr and BCP or regulator concerns? Files are stored and replicated with a leading Infrastructure-as-a-Service (IaaS) provider to ensure high file durability and availability. Data is then backed up and replicated to another data center to ensure continuity. Q. How do I permanently delete my data? HOW DO I PERMANENTLY DELETE MY DATA? When a file is deleted by you or we decommission your instance, it is permanently destroyed by our processes. Q. How do I get my data back and avoid vendor lock-in? HOW DO I GET MY DATA BACK AND AVOID VENDOR LOCK-IN? Virtual StrongBox clients can call our account managers at any time to remove their data and avoid vendor lock-in. Contact us today to find out how we can help digitally transform your business.